Gina decided to come to Dublin for a long, 4 day weekend. We decided to have a nice relaxing weekend, filled with good food and good times. Friday was a nice and chill day. Started off with Gina topping up on her few weeks worth of reading Saturday’s Guardian, and eyeing up some fantastic biscuit recipes we could do later on over the weekend. After a hearty breakfast and Netflix, we decided to head into town to do a bit of walking around and shopping. There isn’t much to report on the shopping front. 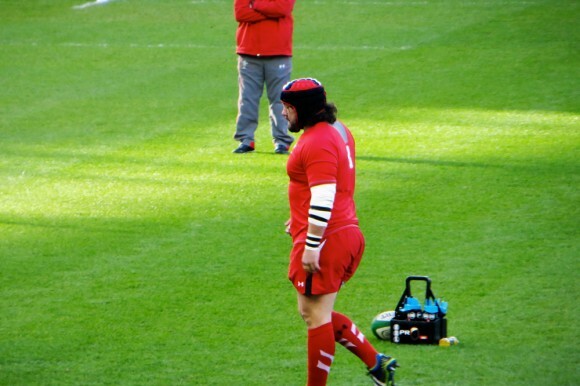 …and yet another unfinished post by Iestyn, it’s becoming ridiculous, he really has the attention span of a froot fly. So I’ll take over it from here. There really is not much to report on the shopping front – the problem is that I come from a very under-served town as far as the variety of shops goes, and as much as I hate shopping, I still needed to give it a go and try to find some work-worthy pieces. I did find a nice pantsuit in Next, which I really liked, but unfortunately it just didn’t fit right, and I ended up empty handed. But anyway, I do like walking around Dublin, and it was nice. For dinner we went to Yamamori, which was super tasty and nice. Saturday was the most exciting day, as Iestyn had a couple of tickets to a Six Nations match in Dublin, Ireland vs. Wales. 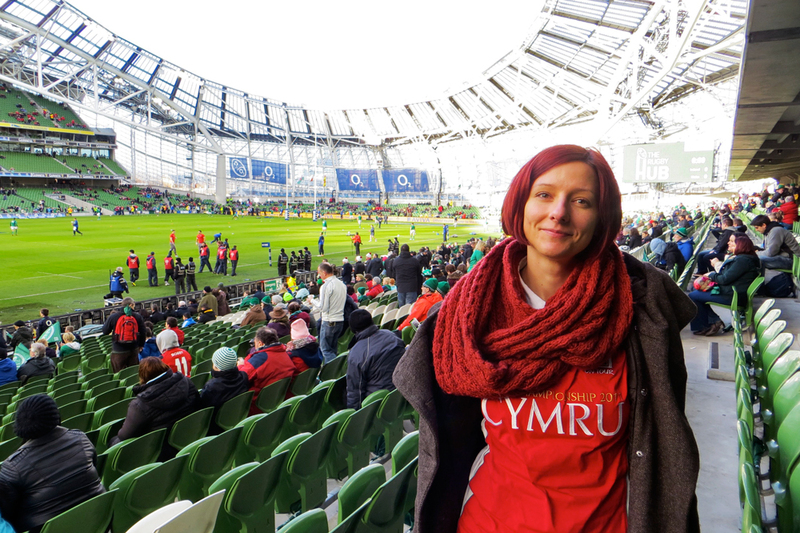 I was super psyched, as I never saw a rugby match live (or any other match, really, if you don’t count volleyball which I played for years). 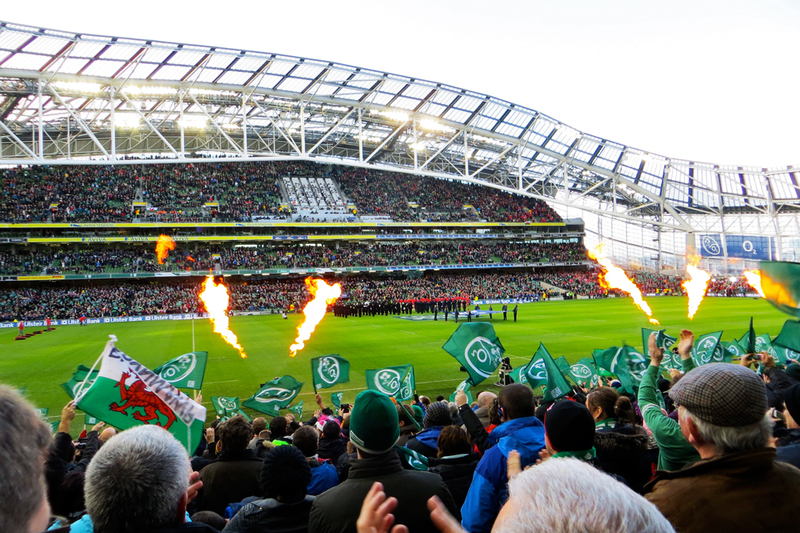 We walked to the Aviva stadium surrounded by crowds of Irish fans, but there were some Welsh groups as well. The weather was nice and sunny with occasional showers, but it was really chilly. We bought some rugby junk food before the match on the stadium, and watched the teams warm up. I was really excited. 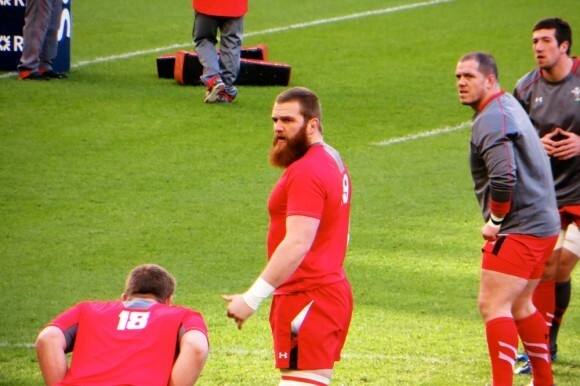 The Welsh looked much bigger and stronger, so I thought that was a good thing, and not only they brought over my favorite sheep guy, but they had a new addition of a proper huge beard (and 2m in height!). I was very hopeful for the match indeed. However, it is fair to say that my expectations were not exactly met by the Welsh team’s performance. As a matter of fact, they got their asses kicked so badly by the Irish, I must say I was a little bit disappointed. 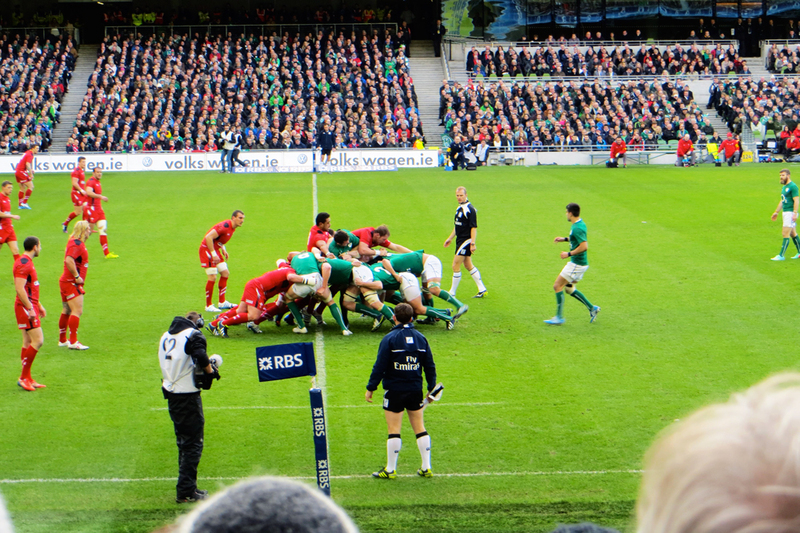 It was still nice to watch all these guys doing their little rugby thing, but if the match was a little bit more even in terms of scores, it would have been more thrilling. Anyway, it was still fun and I was very happy we went! In the evening we went to the cinema as we both wanted to see the new movie by the Coen brothers, Inside Llewyn Davis. We both really liked it, may be I liked it even more than Iestyn, I thought it was very beautifully made. I think i’m going to get it when it’s out on dvd as well and watch it again. On Sunday, we decided to make a batch of the cookies for which we found the recipe in the Saturday Guardian – and I must say it was a great call! They were the Orange and lemon coconut biscuits, and they were divine. With the help of Iestyn’s housemates they disappeared quite quickly. We also went to the cinema again, because we heard such great things about the LEGO movie – and they were totally right, the movie is AWESOME. As a matter of fact, everything is awesome. On Monday, my pressie finally arrived, but it was sent to Egg, so we walked over to Iestyn’s work to get it. I was super excited because I didn’t know what it was. And I was even more excited to open it and find out that it was a new Ward Lock & Co. guidebook for my collection – this one for London! It’s good hundred years old and is in a really good shape too! I love it. I wish we could do our retro project with it around London, it has some cool photographs. In the afternoon it was time for me to go, which is always so sad. 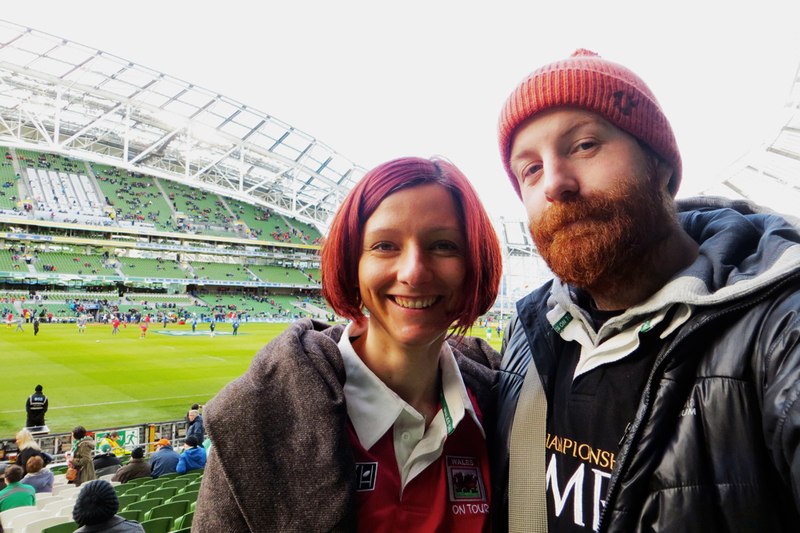 But it was a great fun weekend in Dublin, and we’ll see each other soon enough hopefully. 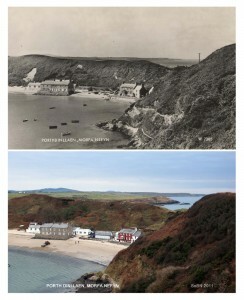 “The town is the capital of Anglesey. It has a promenade Pier (admission 2d.) and provides facilities for bathing, boating, bowls and golf. Near the Castle are the Corporation Baths. Mixed bathing is allowed. 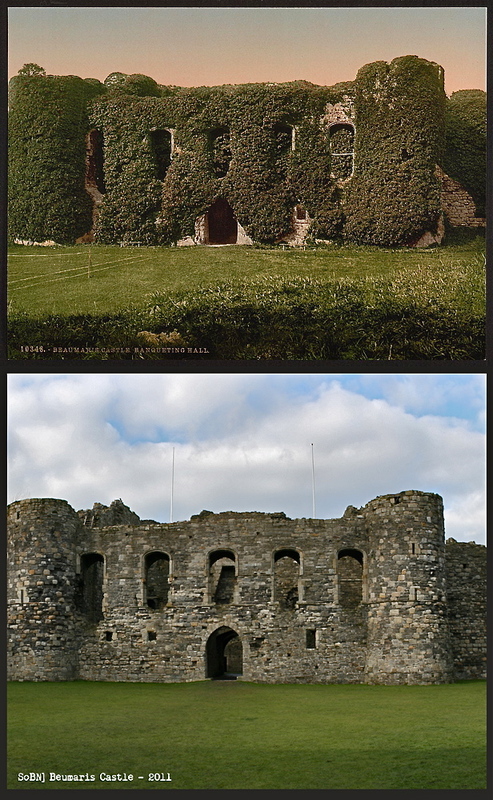 The chief object of interest is Beaumaris Castle (admission 2d. ), which no visitor should miss seeing. It covers a large extent, but is not of great height. It is now under the care of H.M. Office Works. There is an outer wall with ten low towers, and an advanced work called the Gunners’ Walk. On the outside of it’s walls are rings for mooring the vessels that came up to it by a marine canal. The main structure is nearly quadrangular in form, with a large round tower at each angle. The banqueting hall, the state rooms, the domestic apartments, and a small chapel reached by a wooden ladder near the site of the old racquet court, may all be distinctly traced. The castle was built by Edward I, who then changed the name of the place from Bonover to Beaumaris, a French word descriptive of it’s pleasant situation on low ground. The only event of importance in the history of the Castle was it’s surrender to the Parliament in 1646. The grounds are tastefully laid out and contain tennis courts. ConcertsÂ and entertainments in the Pier Pavilion. Ferry.-The Bangor Corporation steamer plies houerly between Bangor pier and Beaumaris pier, Fare, 8d. ; 1s Return (children, 4d and 6d. Weekly, 4s. (children 2s.). Golf.-A capital nine-hole course about a mile and a half fom the town. Fees, 2/- day 10/- week. Motor-busesÂ run from Bangor Station several times daily all the year round via Garth Ferry and Menai Bridge. The buses also run between Beaumaris and Llangoed. There is a steamÂ ferryÂ between Beaumaris and Garth Point, Bangor, in the summer months. The Liverpool and North Wales Steamers call daily during the season. Beaumaris is still a lovely wee town, with a very beautiful promenade and an epic vista of the Snowdonia mountains over the Menai Straits. The castle has always fascinated me, as it’s moat still pretty much surrounds the castle today, which gives it a lovely feel. I do love the old retro photograph of the castle with all the Ivy on it. With the aid of the beautiful road linking Pen-Y-Gwryd and Beddgelert, the two highways running south-eastward from Caernarfon encircle the mountain mass collectively know as Snowdon. The more easterly road from Caernarfon is accompanied by the railway as far as Llanberis. By Llanberis is meant the modern village of that name. It contains the railway station and is a good two miles from the old village. It is a common centre of the motor routes from the Betws y Coed, Bangor, Caernarfon and Beddgelert, and the quarter chosen by the great majority of tourists who make the ascent of Snowdon, the Glyders, the Elidyrs, and Moel Eilio. 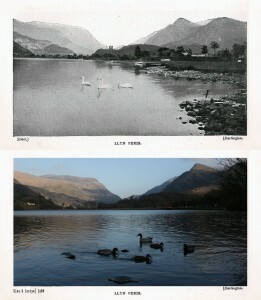 The village is situated on the western side of Llyn Padarn, a lake two miles in length. The lake is connected with Llyn Peris by the river Seiont. Boating can be enjoyed on both lakes, and the lakes and rivers alike afford sport for the angler. At the northen end of Llyn padarn is a picturesque stone bridge leading to a Roman camp at Dinas Dinorwic, about a mile off. A feature of Llanberis often overlooked is the Ceunant Mawr (the ‘big ravine’) with its waterfall, well worth a visit after heavy rain, though less effective in the dry weather. The fall is about 5 minutes’ walk south of the village, up the lane on the right just after crossing the stream as one walks from the station. At Llanberis begins the ascent of the magnificent Pass of Llanberis. Llanberis nowadays doesn’t have a train station, but it does indeed have the World best cafe – Pete’s Eat, and by itself is worth a visit! I love how we managed to pin point exactly the first shot here, it was an epic journey, with beautiful views, sunshine, and sunglasses. 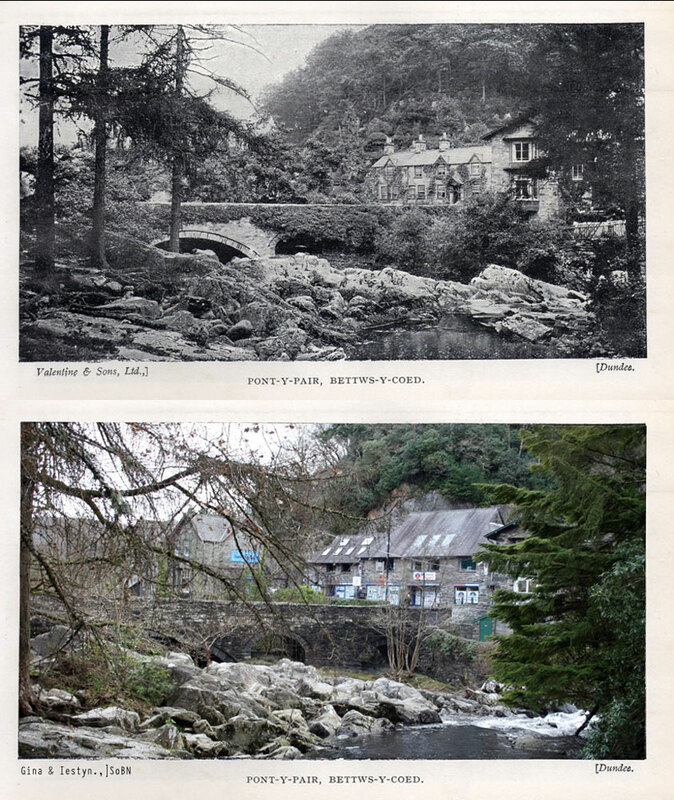 Charmingly situated among tree-clad hills at the point where the Llugwy valley meets the wider, valley of the Conway, Bettws-y-Coed claims with some justification to be “the Beauty-spot of Wales”. During the season it is besieged by visitors, for although the village consists almost entirely of hotels and apartment houses “Bettws-y-Coed” to the world at large includes also the far-famed Swallow Falls and the romantic glen of the Conway. The name means “the Chapel (or the Sanctuary) in the Wood,”and woods and water are its characteristics, despite the heavy toll of War-time foresters on the neighbouring hill-sides. To some extent Bettws suffers from its reputation as a “show place”, for it deserves far longer than the few hours usually devoted to it. As a center for walks or motoring it is splendid ; there is first-class fishing and accommodation to suit all tasters and purses. The resident population is only about a thousand. Lovers of the open sea should walk out to Dinas Dinlle, on the Caernarvon Bay shore. Take the Pwllheli main road as far as the fifth milestone, and shortly after that the road bearing to the right. By taking train to Llanwnda the walking distance may be reduced to 2 1/2 miles, or the bus to Llandwrog reduces it to little ore than a mile. The sands are of the best, and the views of Snowdonia superb. The antiquarian interest too, is considerable. Here Watling Street ended. 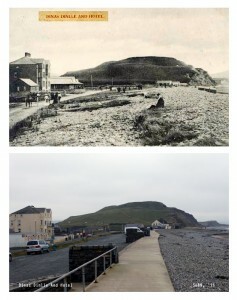 It’s modern representative is the stony track to the immediate right of the building that was the Caernravon Bay Hotel. Dinas Hill is an old roman encampment. Well! This little wee book brings out every kind of knowledge. My parents live really close to Dinas Dinlle, so I know the place very well – spending most of my summers here, swimming in the sea with my friends, I love the place. I have a massive attachment to it, as nowadays, I come down pretty much everyday (when I’m at my parents house) to go for a run, or take some photographs. I never knew that Watling Street ended here, an ancient trackway in Wales & England. 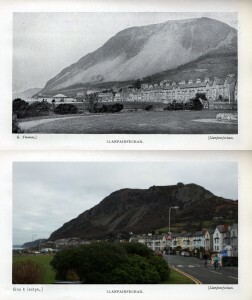 Dinas Hill has always fascinated me. 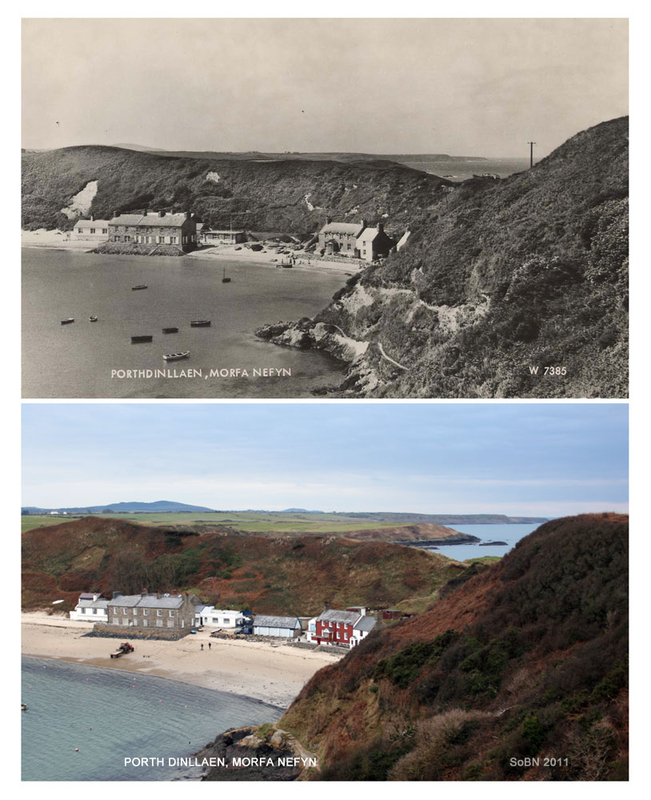 It’s being eroded away now, very quickly (as the photos above also shows) – the sea bashes it every year, and you can literally see chunks sliding down. It gives really nice views of Snowdonia, especially the Nantlle Ridge, and Snowdon itself. Tiss a nice wee place. 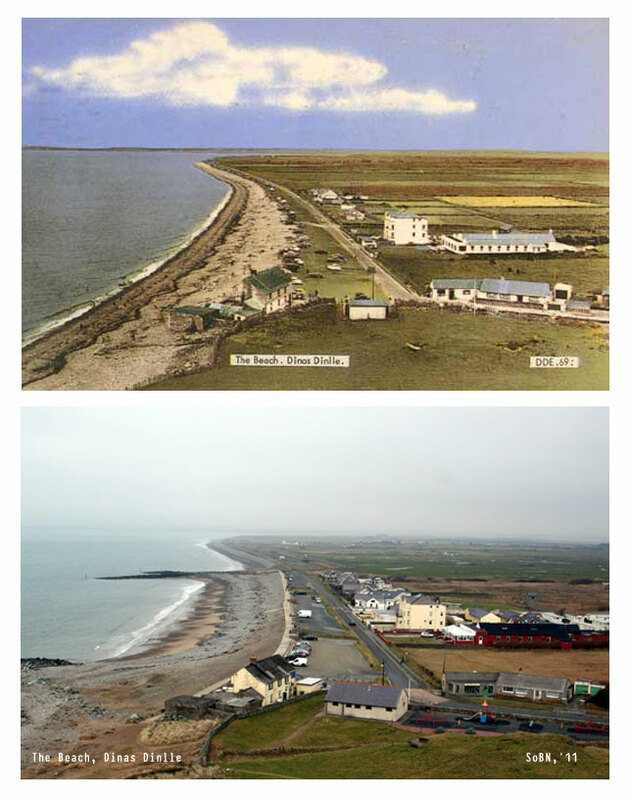 Picture wise, there’s two main differences, more people now come to Dinas Dinlle – in terms of living there, and holidays, as we can see more houses and a huge caravan park on the first picture. 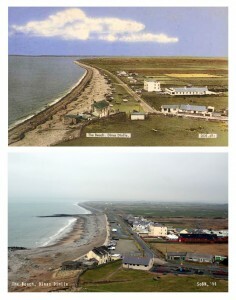 The main thing on the ‘now’ picture of ‘Dinas Dinlle from Dinas Hill’ is the addition of the wave breaker. I remember as a kid going down to the beach, and the person in charge of doing these wave breakers was no other than my granddad. He’s a Welsh farmer, but did some jobs for the Local Council back in the day – and he was the one with his digger, moving and shaping the whole breaker. Good man. He was also in charge of doing the walkway that can be seen on the second image. So it’s nice to know that Taid did some major work here, as it has helped to get some super nice sand to play in on the beach. So, it’s the 20th – January today, and I still haven’t written anything about our awesome New Year’s in Wales. Today seems like a good day to do it because Iestyn is having fun at pub quiz, so I’m home alone. First, it needs to be said that I got awesome awesome presents, birthday ones carefully separated from the solstice ones (just how I like it), and all of them so good. I got me the ubersexy and ubertech mountain jacket that I had loved for ever, and also a beautiful print for the wall, signed and numbered – DON’T SHAVE! Can’t wait to have it with me and hanging. And, on top of that, I got The Ward Lock & Co ‘North Wales ‘ Southern Section’ book! This is the second part to my Northern section book that I already had since our last trip to Scotland, where I found it in a tiny old second-hand bookshop. I cannot believe Iestyn was able to find this, it is really old (probably even a couple of decades than the first one, and that was old already), and truly beautiful. I also got lots of other pretty, nicely smelling, snugly and buzzy things. Capel Curig, beautifully situated on the Shrewsbury and Holyhead road, is one of the oldest tourist resorts in the Principality. The village is about 600 feet above sea-level and has a bracing air. It is a capital resort for anglers, for, besides the lakes at close hand, there are other good fishing waters not far away, and it is much frequented by climbers and walkers, since it is one of the handiest centers for Tryfan, the Glyders and Snowdon. The church is dedicated to St. Curig, a British recluse; hence the name of the village. There are first class hotels, and accommodation can also usually be found, except in the height of the season, in one or other of the cottages. 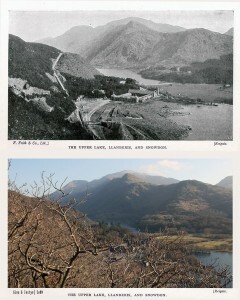 The village is strung along the Holyhead road for nearly two miles at the point where the Beddgelert and Llanberis road strikes off Westward. Buses pass through it on their way to or from Betws-Y-Coed or Bangor. From Capel Curig the Holyhead road rises steadily until it reaches an altitude of 1,000 feet as it passes between the mighty Tryfan (3,100 feet) and Llyn Ogwen, the latter famed for trout and eels. At the Western end, at Benglog, is Ogwen Cottage, a haunt of climbers and anglers, and then the road begins the long gradual descent of Nant Ffrancon, “the Vale of Beavers”. But to be properly appreciated the pass should be ascended. Capel Curig is indeed a nice wee place. It’s funny how these books always mentions the fishing potential of places. 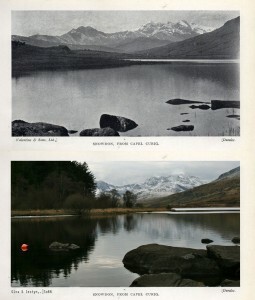 Nowadays, you don’t see much people fishing in the Llynnau Mymbyr, or any other lake for that matter. I don’t think much has changed in the Village since the days of the Red Book, as it’s still roughly the same size as they describe, but today it’s a hub for Mountaineers, as Plas-Y-Brenin is located on the road Westward towards Llanberis. Picture wise – We have indeed managed to locate the correct spot, but there’s now an immense amount of trees growing on the South Bank, which is called – Coed Bryn Engan. Post Office. – In village; branch office towards eastern end of Penmaenmawr ROad. Tennis at Victoria Gardens, towards eastern end of the Promenade, and at the Receration Ground, near Moel Yacht Pond. Tennis tournaments are arranged weekly during the season. In it’s brief but merry course to the sea the little Afon Llanfairfechan dashes first through rocky, fern-clad gorges; then through the gradually widening valley in which the orignial village of Llanfairfechan stands and finally, passing under the coast road, it rattles past the modern resort called into visitors who appreciated this airy, healthy site on the verge of the sea yet within a stone’s-throw of the mountains. This charming contiguity of intrests is well illustrated by the stream which bubbles beside the main street of the village, for although its source is some 2,000 feet above the spot where it runs into the sea, yet it’s length is scarcely three miles. The eastern side of its valley terminates abruptly in the pominent headland know as Penmaenmawr Mountain; it’s western side falls away gradually in green, wooded hills above which giants of Snowdonia raise their heads to the sky. The hills sufficiently far inland for thei majestic proportions to be seen and admired without the observer being oppressed with their too immediate proximity. Yet they are near enough for the ascent to begin at the door of the village post-office, and from any of them views of great beauty and variety may be had. As the site has a gentle slope towards the sea, no great amount of moisture can remain upon the surface. Consequently the air is dry and bracing, and through the shelter afforded by neighbouring hills the climate is genial, as is demonstrated by fuchsias, myrtles, and other tender plants and shrubs – including the pale butterwort, a plant very sensitive to cold-flourishing all the year in open air. The Sea Front at Llanfairfechan is unpretentious, but the bathing is safe and good, and the wide expanse of firm sand revealed by low tide forms a wonderland for children. There is a Green on which various games may be played and at either end of the Parade are public Tennis Courts and Bowling Green. A feature of even greater interest to the juvenile navigators – and their male relatives – is the Model Yacht Pond. It is regularly used by members of Liverpool and Wirral Model Yacht Clubs, and regattas are orginized during the season. 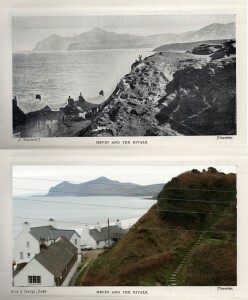 A feature distinguishing Llanfairfechan sea-front from many another is the View:-not the customary wide expanse of sea, but a charming panorama extending from the Great Orme’s Head across to Puffin Island, with it’s striped lighthouse, and then along the variegated coast of Anglesey to the tall roofs of Bangor, Penrhyn Castle rearing its battlement tower above the trees to the south-west, and then the eye travels round by the hills above Aber to remote Foel Fras and so round to the familiar scree-strewn face of “our mountain”. Golf – 9-hole course. 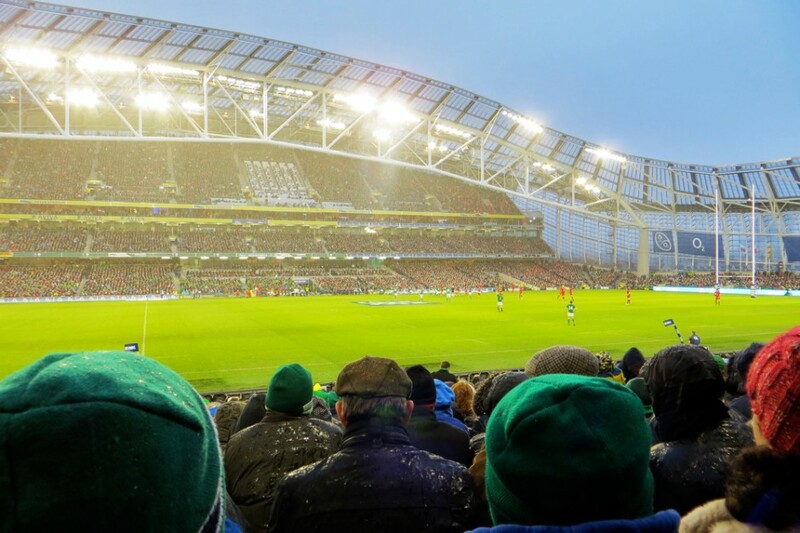 Season tickets: gentlemen 21s; ladies 10s. 6d. Monthly: gentlemen 15s; ladies 10s. Fortnightly: gentlemen; 10s. ; ladies 7s. 6d. Weekly: gentlemen 7s. 6d; ladies 6s. Day: gentlemen, 2s; ladies 1s. 6d. 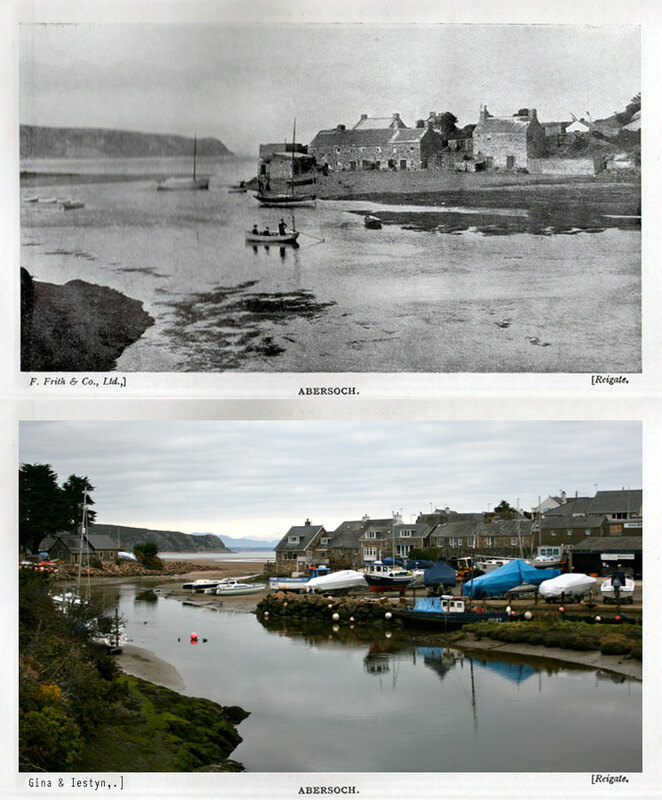 Abersoch, a small watering-place 3 miles from the Nanhoron Valley, stands on the shore of a pretty little bay. The extensive sands afford good bathing, but the tides recedes to a great distance. From full to half-tide, swimmers will find deep water under Benar Hill. Visitors must beware of being surrounded by the tide at this point. Those who care to spend a day fishing for mackerel may make arrangements for accompanying one of the numerous roomy boats belonging to the little port; but, on account of the currents, it is not advisable, even for skilled yachtsmen, to venture alone beyond the bay. In the stream from which the village takes its name there is good trout fishing, execpt in dry seasons. Less than a mile from the shore are St. Tudwal’s Island and Lighthouse. Boats to visit them can be obtained. Abersoch can be reached from Pwllheli by taking the tramcar to Llanbedrog and walking 3 miles. This, so far is the most changed picture we’ve come across. The only thing (apart from Mynydd Tir y Cwmwd – the headland in the background) we had to go by was the two chimneys coming up from the furthest house, centre of the image. Everything else is totally different, and going from the text – grown quite a lot too! 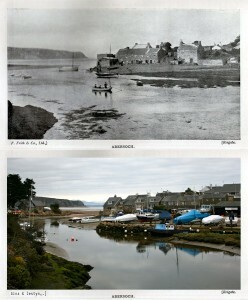 I love the fact, that the only way to reach Abersoch back then, was walking! In today’s World, no such thing exists, shame really.